The sector has been extremely buoyant since the start of the year, with the Real Estate Developers Index up about 25 per cent. A price-to-net asset value ratio is generally used as an indication of a real estate company's value. A ratio of less than one could mean that the company is undervalued, while a ratio of more than one might mean that it is overvalued. "Catalysts will come in the form of higher transaction volumes, resulting in the clearing of unsold inventory or even higher prices," added DBS. "In addition, we are of the view that successful land-banking activities that could mean potential reflation of net asset values will further boost share prices." 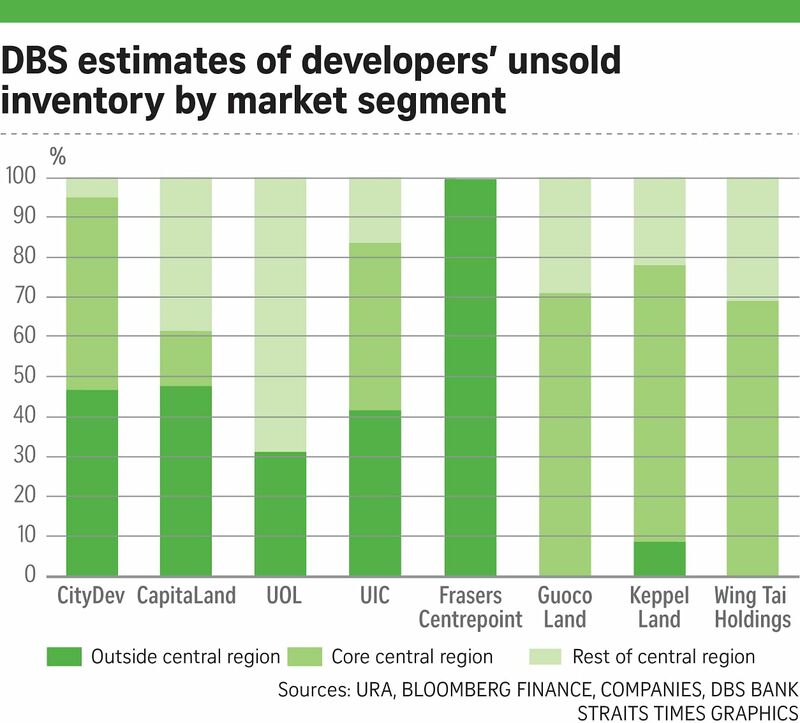 DBS singled out City Developments (CDL), UOL and CapitaLand as its top picks, "given their relatively higher exposure in the residential space compared with peers". In a separate report released last week, Maybank Kim Eng analyst Derrick Heng acknowledged that investors have become increasingly concerned that escalating land prices could lead to a margin squeeze for developers. But Mr Heng also pointed out that the resurgent collective sale market offers alternative land-banking opportunities for developers and could thus ease upward pressure on land prices. Over $3 billion in collective sales deals have been concluded so far this year, with another 30 properties at various stages of the en-bloc process. Six of these potential deals, if completed, could lift sales value by another $2.3 billion and add 4,600 units to the pipeline, he noted. "We believe this offers alternative land-banking opportunities for developers and should ease upward pressure on land prices," said Mr Heng. Moreover, the resurgent collective sale market comes with a "positive feedback loop". "Every household displaced from the en-bloc market would be on the lookout for a new property, which would effectively front-load demand and push out supply," Mr Heng pointed out. The 11 deals closed so far this year would lead to the demolition of 1,600 units from the existing housing stock in the year ahead, while the other six deals could result in a further 1,300 units being knocked down. Maybank has maintained a "positive" call on developers as a whole, with UOL and CDL being its top large-cap picks. Mr Heng noted that, for investors with lower liquidity thresholds, GuocoLand offers "compelling relative value with improving fundamentals". 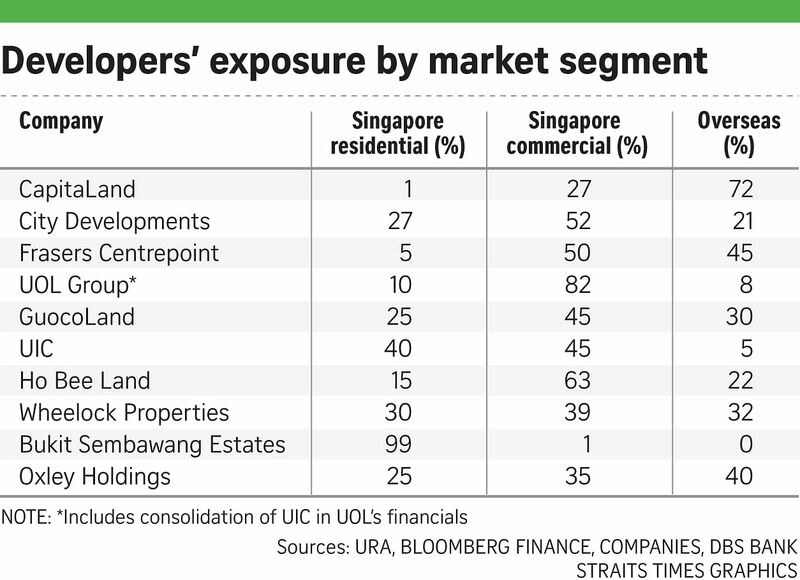 Meanwhile, fundamentals for most sectors across the broader real estate market are turning around, said DBS. It believes that the office/business parks and hospitality sub-sectors will lead the recovery, aided by a larger fall-off in supply. "With Singapore's gross domestic product projected to continue growing at a stable rate of 2.5 per cent, we see potentially stronger pre-leasing activities at office properties leading to an eventual recovery... which would be a catalyst for office real estate investment trusts (Reits)," it said. "Industrial Reits with the financial flexibility to pursue acquisitions or redevelopments... would drive upside to earnings."